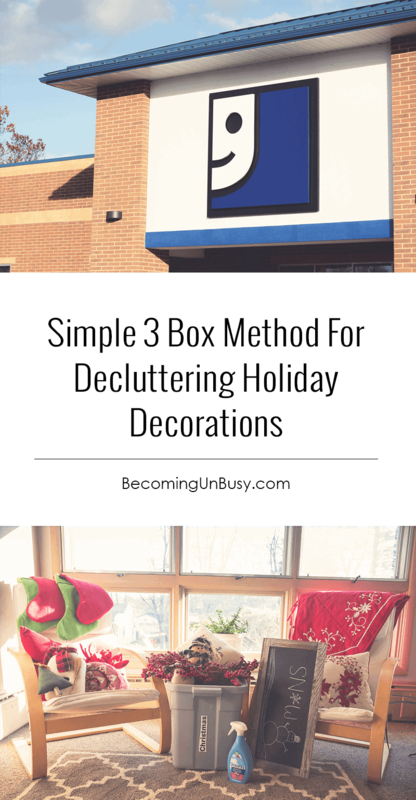 Don't Miss the Opportunity to Declutter Holiday Decorations This Weekend! I sit staring at Grandma Rosie’s bright green, sequin-laden holiday monstrosity. The girls have already helped me place all of our favorite holiday decorations around the house. We’re now to the [blah] section of the decoration box — the random regretable clearance buys you feel bad getting rid of because you just bought the “must have it” sale item last year, the old holiday hand-me-downs, the collection of gotta-keep-it guilt pieces. Not sure how to best phrase my response to this sparkling family treasure I sit dumbfounded. My daughter plays with the felt puff balls along the edge of the runner and then lays it on the back of the couch exclaiming, “It looks pretty here.” She then proceeded to spin around the living room half-singing, half-yelling Jingle Bells at the top of her lungs with her little sister. She’s distracted, so I do something I’ve never done before; I put the lid on the storage container, still half full of “not my favorite” decorations, and put it back into the basement. Now don’t get me wrong, there is nothing wrong with holiday hand-me-downs and family heirlooms. We’ve got beautiful hand-pinned sequin ornaments from Grandma Rosie on our tree and treasured hand-quilted blankest around the house. But must we display every item ever given to us? I say, no. No, we don’t. Now, I’ve got to admit, I’ve recently fallen into minimalism. My husband is a true minimalist, but me — well, I love stuff, gift-giving is my Love Language. So how could I possibly be a minimalist? My definition of minimalism is different. I don’t want my kids to think of minimalism as getting rid of everything they own. I want them to see it as the exact opposite. I want my children to learn the power of surrounding themselves with people and things that bring them absolute joy. So, what NOT to do this weekend? Mindlessly pull out the holiday decorations and start trimming the tree. In life, we tend to simply go through the motions. We get up and live our day-to-day never genuinely questioning our actions. The same can be true during the holidays. We walk through the season without thought. I ask you to do something DARING this year — only display decorations you absolutely LOVE. I invite you to declutter holiday decorations this weekend with us as you prep your house for the season. Starting is as easy as 1-2-3. First, go the basement, the hall closet, the attic and gather ALL of your holiday items and place them in ONE SPOT. 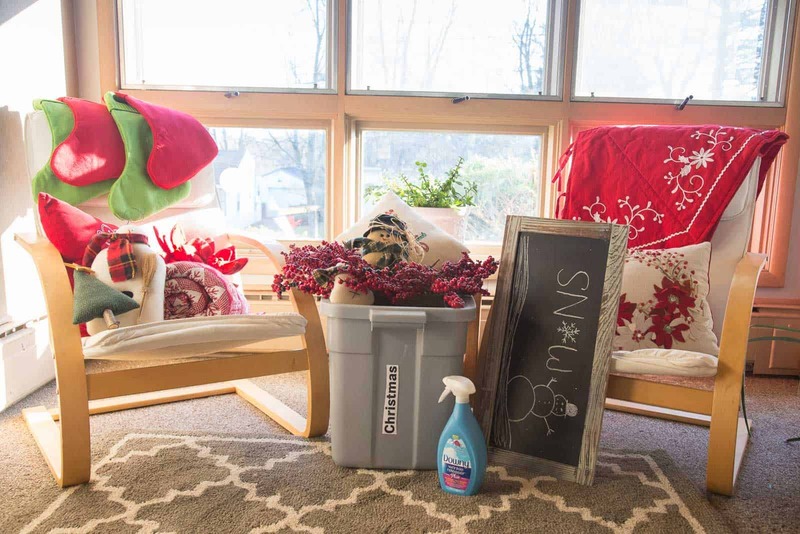 You’ll want to grab your decorations, your holiday kitchen items, your kids’ Christmas sheets, the outdoor string lights — everything, together, one spot. It is much easier to assess what you have and declutter when everything is together in a single location. Next, grab yourself a recycling bin, a garbage can, and three cardboard boxes (label them —donate, give, save). Finally, turn on the holiday tunes and set the mood for fun. This is going to be fun after all, I promise. The first step to decluttering holiday decorations is to pull out the things you LOVE most and place them around your home. Again, taking a minimalistic approach towards the holidays is not about getting rid of every you own; instead, it is about surrounding yourself with the things (and people, of course!) that you love. For example, I love snuggling my daughter with this fleece-lined holiday blanket while watching Christmas movies. I also adore this handmade tree-hugger ornament my daughter made in kindergarten. DONATE — Items you’re going to box up and put in your car today. GIVE — Sentimental items you want to gift to friends and family. SAVE — A place to collect holiday decluttering roadblocks. As you go through your items, here are five questions you can ask yourself to make the process easier. There are always a few things — sentimental things, family things, gifted things — that make decluttering holiday decorations hard. Don’t let these things slow you down. If you’ve got specific items that don’t necessarily bring you joy, but you also cannot bear the thought of donating or giving it away, it’s ok. Don’t feel pressured to display these holiday decorations in your home. Just add the items to your SAVE BOX. After your house looks just as you want, close the SAVE BOX and put it back into storage guilt-free. Did anything break (or burn out) during the holidays? Will you be excited to put this item out again next year? Could someone else benefit more from having it? When you put away your decorations, be sure to take a moment to review the SAVE BOX you had in storage. How did it feel not showcasing these particular items? Do you feel comfortable with donating some of the items now, after the holiday? If yes, great. If not, don’t fret. Pack up the box guilt-free and reassess next season again! I have to be honest; it took me three years of boxing up that crazy green Santa table runner before I could let it go guilt-free. Remember simple living is not a destination, but rather an ongoing journey. I hope you enjoy a peaceful, UnBusy holiday season with your family surrounding by decorations that bring you absolute JOY.